Training the midsection has more exercises, devices, diets, experts, and gimmicks than any other body part. Everyone wants a six pack. It's evident though that most do not want to commit to the eating habits that will let your abs shine through the skin. No amount of crunches is going to yield detailed abs if bbq, donuts, and grains are part of your daily diet creating a blanket of fat and swollen tissue. Definition in the midsection is truly about eating...not so much about exercise. The focus of this post is about training the region, the eating recommendations are found all over this site. - A beer gut or beach ball like midsection is not so much fat as it is swollen intestines due to poor digestion and food choices. 27 feet of circular bowel swollen even a little bit adds up big time! Deflating begins with eliminating inflammatory foods like grains, dairy, sugars, ...and alcohol. - As you'll see below and in the accompanying video there is more to getting ripped abs than just crunches. - Ab muscles are just as much back muscles, which work in concert with many muscles all around the midsection which is why I prefer to call it Torso training. 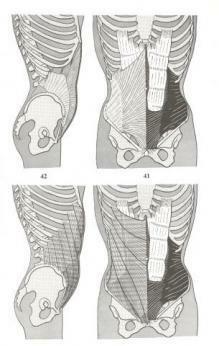 - Most lower back pain stems from weak abdominals...and excess weight. - The word 'Core' or 'Core Training' has been misused and abused to the point of being ridiculous. Standing on one leg on an inflated bosu ball is not increasing core strength, it is a gimmick. - It is impossible to isolate one specific layer or muscle in the abs. - More is not better. 1000 crunches is not going to help. 4) Transverse Abdominus: deepest layer with fibers running horizontal around the torso to the back. Think girdle. Abs also facilitate breathing, stabilize the spine and pelvis, improve and maintain posture, and keep your organs insulated and protected. Strong abs actually decompress the spine eliminating wear and tear on deep structures like the ribs and precious nerve roots that exit at every level. There are literally countless ways to train the muscles of the Ab and Torso region. One look at the multitude of fiber directions reveals this. Progression is pinnacle, Variation is essential, and overtraining unwarranted. In the beginning, a crunch, becomes a cross over crunch, which may become a reverse crunch. Progression to a ball crunch, loading with added resistance, and altered foot placement may be part of your variations. * It is imperative to know, realize, and accept your capabilities and limitations. The spine and it's intricate structures must be respected and trained appropriately. Do not force a motion that is not available or causes pain. If it hurts, don't do it and get it checked out by a medical professional. Any movement of the upper body in relation to the lower body involves every torso muscle to some degree. There is no such thing as muscle isolation. Bend, lift, twist, sidebend, rotate, etc. involves a multitude of muscles around the entire region. A movement such as lifting and twisting will involve not only the ab muscles, but those of the back and sides as well. Small intricate muscles like multifidus, rotatores, and larger spinal muscles like Longisimus, Iliocostalis, Spinalis, work in concert with the external/internal obliques. Abs become Torso. - Focus. Just going through the motions pounding out 30-40-50 reps hoping for detailed abs isn't going to cut it. You have to dive inside the muscle creating a so-called mind-body connection and focus on the movement with perfect form. - Variation is the key. Within any given workout I recommend at least six different exercises. - Progression. Just as with any exercise don't start out with a ton of reps, or weight behind your head. - Patience. Abs we're not built in a day. It takes time for the fat blanket to melt away to revel abdominal divisions. - Once a movement's form is perfected, add resistance to it. A dumbbell, rubber tube medicine ball work great. - Change the direction of the crunch. Rotating, twisting, and diagonal directions of motion will ensure variation and draw in different fibers. - Breathe! Extra triggering of an muscles can be facilitated by exhaling as you contract. - Always incorporate some static stabilization exercises like planks to compliment the movement exercises.